I love adding greens to everything! 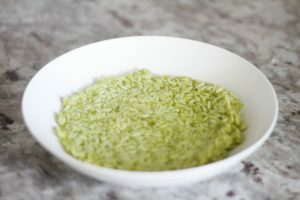 Giving rice more flavor with veggies, not only is fun for your tastebuds, but great for your body. 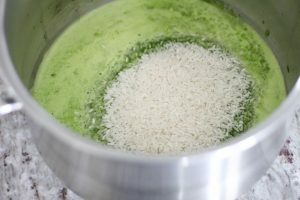 I love making this green rice for veggie bowls, enchilada bowls, veggie taco bowls and more! Get out your blender and add the kale and spinach. Chop the 2 jalapeños and be sure to remove the membrane from one of them. Drop chopped jalapeños into the blender. Pour 1 cup water into the blender and blend. Once blended pour mixture and 2 1/4 cups water into a large pot. Drop 1 veggie cube in. Add the salt, olive oil and rice. 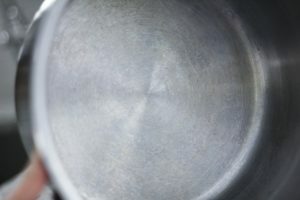 Turn the pot to high until boiling then turn down to med/low heat. Stir occasionally as the rice cooks (keep the cover on when not stirring). 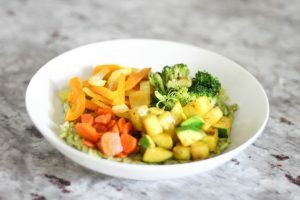 As the rice cooks I typically cut up veggies and cook them to go on top of my bowl. Once all is cooked, enjoy spicy lovers! 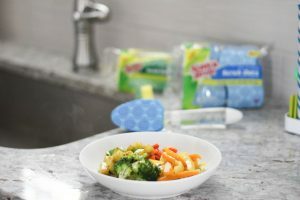 Cleaning up is not my favorite part of cooking, but it’s so much easier when I use Scotch-Brite™ Brand products. 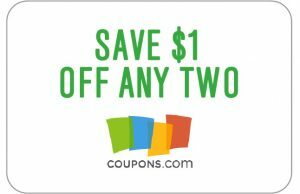 My husband and I have been using them exclusively since as long as I can remember. 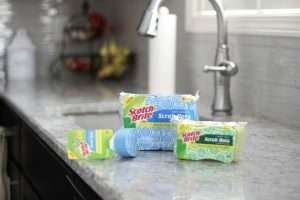 The new Scotch-Brite® Scrub Dots are my absolute favorite because the dots get the scrubbing done however food doesn’t get stuck in them, therefore they rinse clean. 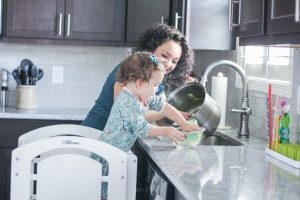 The blue Scotch-Brite® Non-Scratch Scrub Dots Dishwand has quickly become our best pal for cleaning up the dishes, especially cooked on messes, such as rice. It releases dish soap from the handle, which means one less step for me. 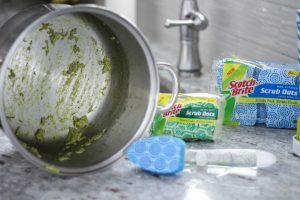 For the stubborn food we use the Scotch-Brite® Heavy Duty Scrub Dots Sponge, that’s the yellow and green sponge. 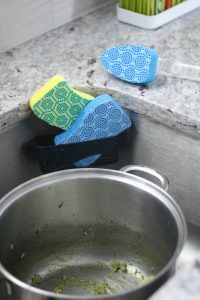 This is how we finish cleaning the rice off the pot. 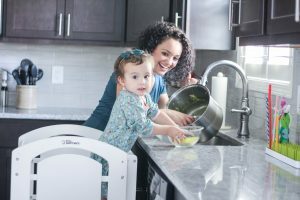 Izzy loves standing next to me and helping out in the kitchen! 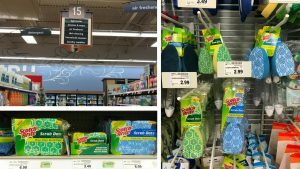 To ease the process of finding our favorite sponges, in Kroger I found them in isle 15. This should include dish cleaning, household cleaners and laundry supplies on the sign. The sponges and wands where actually in two different spots, so If you find one, go a little further down the isle for the other (they were on opposite sides and ends of the isle in my store). Happy cooking & cleaning friends!